This post originally appeared on Green Girl Eats. I’m going to guess that a lot of pumpkin recipes on your Thanksgiving horizon are of the baking variety, right? Pumpkin rolls, muffins, and probably a pie or two. No arguments here! Still, the beauty of pumpkin is its versatility to be the star of dinner and dessert. And breakfast. And any time of day you feel it appropriate to have, I don’t know, a pumpkin donut. Because that would fall under morning, noon, and night if you ask me. Pumpkin is everything. Pumpkin is life. Risotto is an increasingly popular way to enjoy the fall-themed flavor of pumpkin, especially when you pair it with a combo of savory-sweet spices (think cumin and cinnamon) and top with a little fried sage, an herb that pairs beautifully with this seasonal squash. Thoroughly heat your stock in a small saucepan. It’s important to start with warm vegetable stock, rather than refrigerated or even room temperature, as this will affect the way the rice cooks. In a larger pot, add a tablespoon or two of olive oil. Add your chopped vegetables and garlic and stir constantly, so as to fry but not brown. After about 10 minutes of stirring, add your rice. Keep stirring and wait until you notice the rice going slightly translucent around the edges while staying white in the very center. This will happen relatively quickly and is more or less frying the rice. Add your salt, pepper, cumin and cinnamon. After this happens, about two to three minutes, add your pumpkin purée in half-cup increments. Stir rapidly to incorporate. At this point, it’s time to slowly add your stock, also in half-cup increments. Allow each scoop of stock to be fully absorbed by the rice before adding more liquid. Though the stock will disappear into the rice relatively quickly each time, it’s important to keep stirring as to avoid sticking or burning. Once you’ve used all your stock, have a taste: the rice should be al dente, or still retain a slight bite or chewiness, while the stock lends a creamy factor to the texture. If it’s still slightly too tough, add more pumpkin purée or stock. When the desired texture is achieved, stir in your butter. If you’ve opted in include cheese, add now. In a small pan, add a tablespoon or two of olive oil (coconut oil will also work well here). Add your sage leaves (carefully) and fry for about 30 seconds on each side. Don’t let them get brown, only slightly crisp. Top risotto with sage and an extra sprinkle of Parmesan. There are many things in life to be grateful for: Warm, yummy food cooked with love is definitely one of them. Enjoy your creation! 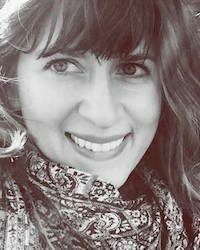 Helen Williams is a Colorado transplant who is passionate about cooking, writing, and combining the two on her vegetarian and vegan food blog, Green Girl Eats. She strives, every day, to be less sorry. When she’s not in the kitchen, you can find her reading, loving the community at Holstee, or trying to pet your dog.